Great sound and stage-ready power from a super-versatile, portable head. 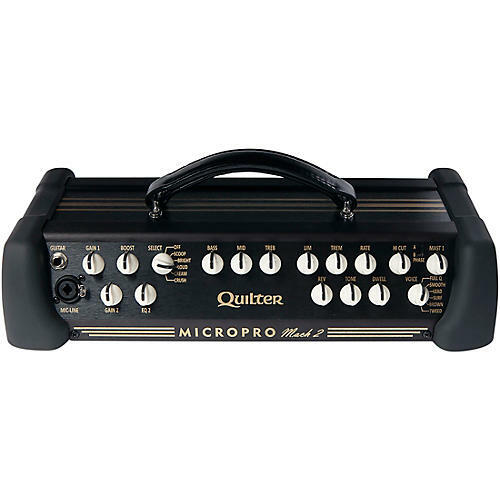 The Quilter Mach2-HEAD MicroPro Guitar Amplifier Head is not just a game changer. It is the game changer. Pat Quilter spent hours analyzing what makes some of the greatest vintage amps so great. Then he developed analog technology that re-creates these voices and delivers unprecedented tone shaping options. Flip that voicing switch. Go ahead. This isn't like purchasing just one amplifier, it is like purchasing six of the most sought-after tone standards of the last 40 years. And, no, it's not modeling. This is a patented recreation of the actual behaviors of these vintage amps. Unleash the Mach-2 HEAD on your Quilter extension cabinet.